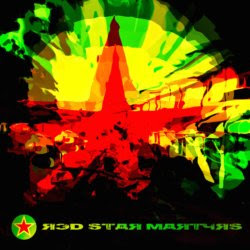 Blessed with a devotion to dub and roots culture and politicised by the inequalities that haunt a world of plenty, Red Star Martyrs have arrived as the latest incarnation of musician and producer Stanley Wood. As a member of cult Birmingham reggae outfit Route 81, Stanley learnt his trade as a guitarist and gigging musician before becoming part of guerrilla graffiti specialists and urban raconteurs Echo Base. Here he encountered for the first time the mystical world of the recording studio and within it, the wonders of the Roland Space Echo – a love affair was born. Their first EP includes two tracks, "Insurrection" & "Independence", accompanied by the appropriate dubs for your personal recreation. “Insurrection” is a heavy stepper tune, followed by two exclusive mixes in one drop and breakbeat style. 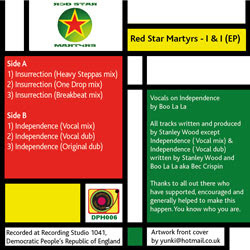 First appearance of Mrs Boo La La aka Bec Crispin on “Independence” spreading the rootical vibrations all the way.